The Lakesmere Group is delighted to have won a top award at the UK Roofing Awards 2017, organised by the National Federation of Roofing Contractors (NFRC). The building envelope and façade specialist was recognised in the Sheeting and Cladding category for its work on the Optic Cloak, the striking anodised flue tower at the heart of the new Greenwich Peninsula Low Carbon Energy Centre in London. Lakesmere faced strong competition from the other shortlisted projects in the category and not least from another of its own contracts, the new southern entrance at Leeds rail station in Yorkshire. Judged by a panel of industry experts, the winning projects were those that satisfied the exacting criteria of demonstrating a high level of complexity, workmanship and problem solving. The judges also looked at the overall aesthetic qualities of the building, environmental qualities and its contribution to the built environment. The new headquarters building for global technology company ARM has been planned to achieve a BREEAM sustainability rating of ‘Excellent’ and will connect to ARM’s existing campus via a covered link. A key feature is the projecting bespoke silver anodised aluminium perforated vertical fins. These reference ARM’s core business of creating processor designs for silicon chips by depicting the underlying technology of integrated circuits, inspired by the crystal lattice structure of silicon. 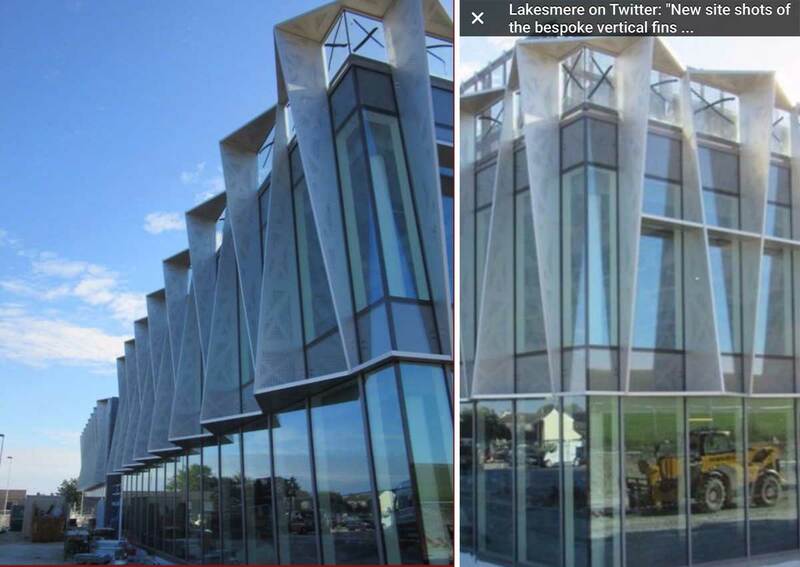 The building emulates this concept with three levels of crystalline blades. As each blade is revolved one can see Kikuchi bands composed of a pattern that imitates the atomic structure of silicon forming a pattern across the body of the blade. Project: Richard Oastler Building, University of Huddersfield. The Museum's largest development in over 100 years has recently been completed. A new entrance through the remodelled Aston Webb Screen, featuring anodised aluminium gates by United Anodisers, leads to the world's first porcelain tiled courtyard and a versatile 1,100m² column free gallery, purpose built for the V&A’s world class programme of exhibitions. The Building is Overlooked by Conran + Partners’ St Paul’s Tower (Two Colour Anolok Bronze) , which stands as the city’s tallest building, and the iconic ‘cheese grater’ car park (Silver Anodised) can be seen in the background both anodised by UA. 700m2 of the surround fencing for the college was anodised using Anolok® 543 and supplied at the end of February 2017. A further 667m2 will follow shortly to complete the project. Project in partnership with Fleetwood Group and Metalline. Central Square is a spectacular new office and leisure complex located within 2 minutes walk of Leeds train station. An emblem of the city’s ambition, the landmark development binds together a dynamic business district to create a vibrant new destination for the public and tenants. Descending into a valley at Grace Farms in New Canaan Connecticut, The River consists of five volumes linked together by a single curving roof. SANAA designed the project with Handel Architects serving as the executive architect. The new building provides a sanctuary, library, court, commons, and pavilion, all under an aluminium roof by Zahner. The renowned British artist Conrad Shawcross was commissioned by Knight Dragon to create a major new architectural intervention for the Greenwich Peninsula. The recently completed Optic Cloak is part of the Peninsula's new low carbon Energy Centre, and has been designed in collaboration with the architectural practice CF Møller Architects. Earlier this year, with a major expansion & investment, UA significantly increased the volume capability at its production facility in Huddersfield. Now with further investment, UA are installing an Anolok II Blue Grey facility in order to increase the size of product we can anodise to the increasingly popular Blue Grey colour range. The new plant will give the capability of processing sheets up to 50% larger than our existing facility in Uxbridge. The use of 2016 electronic sophistication should ensure that our colour matching and repeatability are second to none. These significantly improved facilities for volume and colour range, once again distances UA from all its major competitors both in the UK and Europe. All colours are offered with a lifetime guarantee. I would like to take this opportunity to thank you and your staff for the support and effort put in on behalf of MSL to achieve such an accolade. This was an extremely difficult and risky project to undertake and when you look at some of the photo’s I have attached you should all be as ‘chuffed’ as I am at the outcome. I should mention that we not only manufactured and installed the canopy, tower and reception but refurbished the main stair up to 1st floor, closed in some external wall panelling, installed a new large plant platform and a demountable access ladder. The new £20m Southern Entrance at Leeds train station has recently been unveiled to the public, benefitting thousands of commuters. The state-of-the-art entrance will provide a direct link to the city’s growing south bank area – saving passengers up to an hour of travelling time each week. Up to one fifth of the station’s 100,000 daily users are expected to benefit from the entrance, which also aims to ease congestion at the existing tickets gates. The train station is the UK’s second busiest outside London and has seen rising demand for a southern entrance with the development of major office spaces in the area such as Bridgewater Place, ASDA’s UK headquarters, Holbeck Urban Village and Leeds Dock. The £20m scheme is a joint project between West Yorkshire Combined Authority, Leeds City Council, the Department for Transport and Network Rail. United Anodisers were responsible for Gold Anodising the bespoke shingles and associated metal work.The materials were manufactured by George Gilmour Eco Metals Limited and the Cladding Contractor was Lakesmere Limited. Following several years of successful growth, UA has decided to significantly increase the production facilities at its 45,000 sq ft Factory in Huddersfield. The inclusion of more anodising tanks and a sophisticated magazine handling system will dramatically increase the output. The increase in capacity of around 50% will give the new facility an output capability of 4 million sq metres across our full range of colours. The improved facility allows simultaneous processing of multiple UV stable dye colours thus enhancing our ability to produce UnAmill products. The one million pound investment is being funded out of ongoing profitability and will make the new facility more efficient and cost effective. Most of the major plant installation was completed in the Xmas shutdown and the new facility will be fully up to the new capacity by Mid March. The improved facilities will keep UA at the forefront of European anodisers in offering a wide range of architecturally proven colours each with our exclusive lifetime guarantee. Recent, January, images of our panels fabricated and anodised Natural to 20 microns. Supplied to Shenzhen China for the new Gang Xia retail development. 6500 square metres shipped from UK to China in a three month period. One of our many projects worldwide. 2016 marks 45 years of UA producing the range of electrocolour bronzes using the Cobalt based Anolok™ process. During that time almost 20 million of square meters of Anolok™ bronze extrusion and sheet have been processed and installed on thousands of buildings all around the world. Due to its inherent durability and fade free nature Anolok™ Bronze became the predominant finish for major buildings worldwide. This indeed is still the case. The 45 years of production have seen many changes and improvement in technology, not the least Unicol colour matching, unique to United Anodisers. The Anolok™ colours are produced by metal deposition and light absorption giving a totally fade free finish. This has meant that over the 47 years of production and use on thousands of major buildings not one single claim on durability has been received, not one. The amazing durability of our Anolok™ finishes is due to an inherently safe process backed by our rigorous quality control standards. We now are confident in offering a lifetime guarantee on all our Anolok™ Bronze products, something that none of our competitors are willing to match. The Project was designed by FaulknerBrowns Architects who were responsible for the building and surrounding infrastructure on the Science Central project. The project is billed as the future home of science and sustainability in Newcastle and is located in a prime position in front of St. James Park the home to Newcastle United FC. Main contractor: Sir Robert McAlpine. Following our involvements in major projects in 2013 in the Middle East, 2014 saw UA products used on major projects in both China and the United States of America. Clients have been persuaded by the extra security and peace of mind from using our tried and tested products, with their lifetime guarantees. We have plans in 2015 to further expand into the two largest markets in the world. Process: Natural Anodising - 20 µm 5481 Panels - 5,500 m². Project: Grace Farm - a pavilion in parkland. UA’s anodising has featured in many Stirling prize shortlists. Following on from our previous successes, we are proud to announce that in 2014, 4 projects of the list of 6, including the winner, contain elements of UA’s unique colour range. This shows the importance placed by major architectural practices on anodising’s superior durability and UA’s lead in quality anodising. People Façade anodised by United Anodisers using textured Anolok™ Bronze process. Louvre and cappings on the 4 ventilation towers anodised using Anolok™ B54 superior black finish.